A new survey by Pew in the US has revealed that a staggering “44 per cent of those ages 18 to 29 say they’ve deleted the app from their phone in the last year”. Overall, of the 3,400 Facebook users surveyed, 26 per cent of respondents said they had deleted the app; while 42 per cent had taken a break from the app for several weeks. The study only included Facebook’s main app and did not extend to subsidiaries such as Messenger, Instagram or WhatsApp. 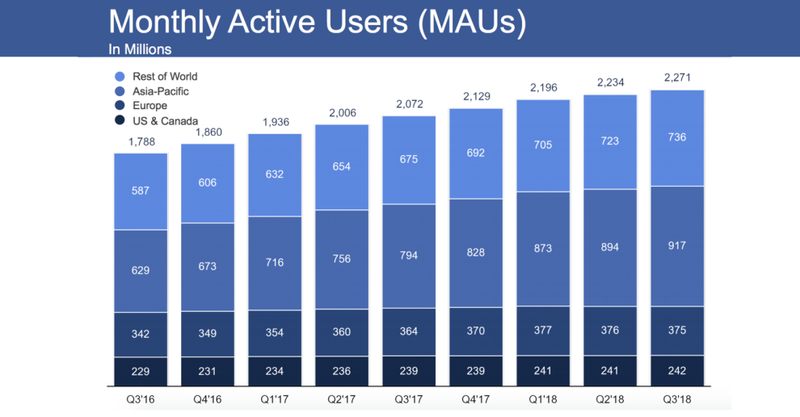 But not everyone is leaving Facebook – as part of its recent Q3 earnings report, the social media giant announced that it has now reached 2.27 billion monthly users globally, up 37 million users from the previous quarter. Part of this growth included over 1 million new users in North America, where the platform had experienced no growth last quarter. The platform also added an additional 24 million daily active users, hitting 1.49 billion (up 1.36 per cent compared to Q1). However, the platform also saw a decline of 1 million users, both monthly and daily, across Europe. Facebook also revealed that its ad sales were up 33 per cent year-over-year, which the platform hopes to build on through its increased focus on Stories and vertical video advertising. Across its three Story offerings, Facebook currently sees one billion Stories posted per day. After its initial test launch with 50 publishers across North America, Latin America, Europe and Australia, Facebook has announced it will be expanding its breaking news tag to publishers in more countries in Europe and Asia. In addition, users in Australia, France, Germany, Mexico, Spain and the UK will now be able to see content labelled with the tag. The platform is citing the success of the trail, the results seen with publishers, and the positive reaction from users as the reason for the expansion. After years of staying ad-free, WhatsApp has announced plans to bring ads to its Status feature (its version of Stories) as part of a plans to monetise the popular messaging platform. Currently, there is no timeline on when the ads will start appearing. Last week the platform announced an update which will allow users to share IGTV previews to their Stories. By tapping the airplane icon and selecting ‘Add video to your Story’, users will be able to share a preview of their favourite shows which friends and followers will be able to watch and click through to see the full show. Snapchat is expanding its TV-like content offering to the UK via new partnerships with 17 media owners, who will be launching 25 Snapchat Shows in the coming weeks. The list of new partners includes The Guardian, Channel 4, Sky News, Vice and PinkNews. The Shows are monetised through the placement of six-second unskippable ads, which Snapchat and the publisher split the revenue on (at an undisclosed split). Shows are proving popular with publishers and brands, as “the investment required by the publishers for Shows is lighter than for daily Discover editions”, and also with users – as “time spent in Shows has more than tripled since the beginning of the year”. At an event last week, Twitter CEO Jack Dorsey said that he was not a fan of the heart-shaped Like button and “would be getting rid of it soon”, and it wasn’t long before Twitter fans took to the internet to express their displeasure at the potential threat to the feature. Twitter was quick to respond, stating that no plans had been confirmed. Pinterest has launched a new self-service ad offering, called Promoted Carousel, which enables advertisers to add up to five images to their ad at one time. “Promoted Carousel ads can be served in Pinterest’s home feed, Related Pin or search fields of the photo-sharing network” and are clickable back to the advertiser’s website. The update aimed at helping brands achieve direct response KPIs on social by helping give consumers a better understanding for the brand and its products. Video platform, Vimeo has announced an integration with LinkedIn which will enable paying subscribers to share videos they upload with a single click. The new option is now available within the ‘Publish to social’ feature – which is open to Plus, Pro, Business and Premium account holders – and will enable users to publish the video content natively to the professional network, in addition to the pre-existing options of Facebook, YouTube and Twitter. After being on the cards for some time now, Apple has finally released its suite of ginger emojis to users of iOS 12.1. The latest additions to the emoji family will also feature people who are bald, have grey hair or have curly hair – so no matter what your hairstyle, there’ll likely be an emoji for you. 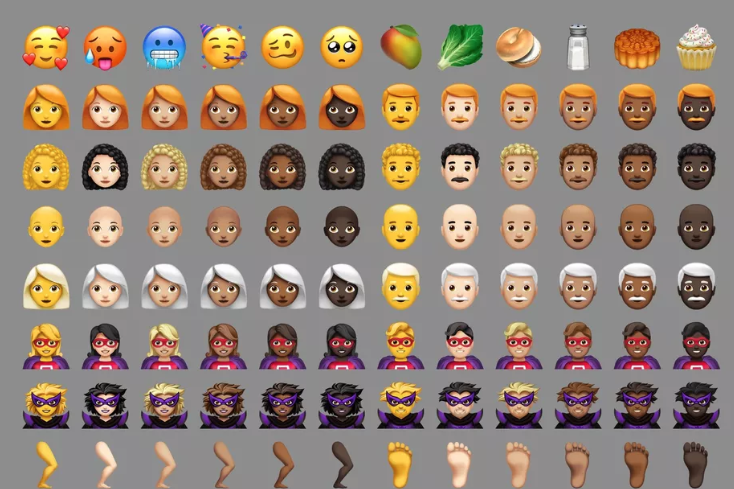 These come as part of the 158 new emojis introduced with the update (if you factor in all skin and gender variations), which also include a badger, a disembodied leg, and the much debated ‘Woozy Face’. 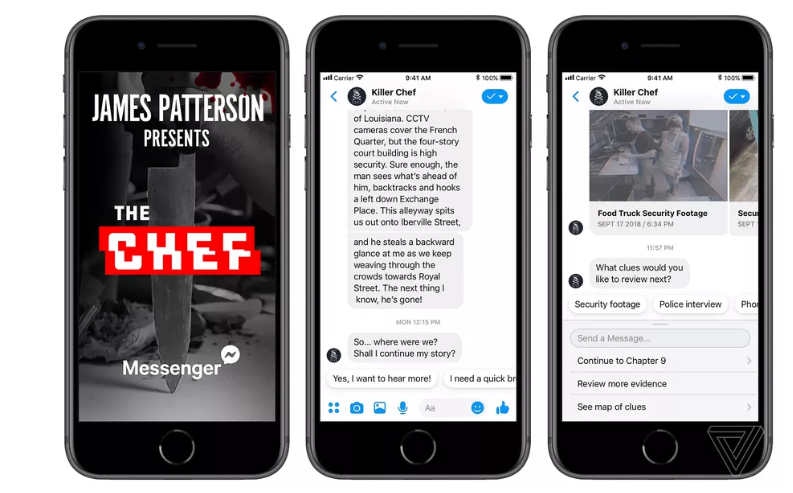 One of the world’s biggest authors, James Patterson last week debuted his latest novel as a “digital novel experience” via Facebook Messenger. The Chef, which will formally be published in February, was adapted for the messaging platform so that users could “begin reading, while also interacting with the characters and locations with videos and sound clips that tie into the story”. Facebook also supplemented the story with live Q&A sessions with Patterson, and it will launch Instagram profiles for the main characters. The post We Are Social’s Monday Mashup #421 appeared first on We Are Social.